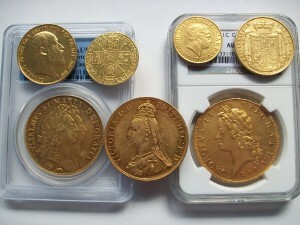 Sovereigns from 1817, 1818, 1823, 1836 N in shield, 1874 London, and many others. We always welcome wants list, so if somehow you find something we haven't got, let us know; we'll inform you as soon as we obtain it. You'll hear from many dealers how hard it is to obtain new material, but you'll never hear this from us, we obtain 100's of coins on a weekly basis and they are on here asap. So have a good look and then contact us.